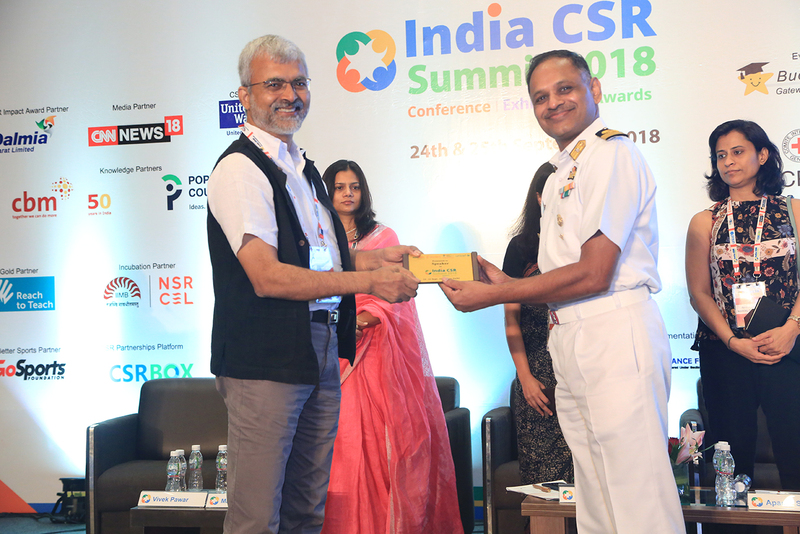 “Representing our Organisation in a summit like India CSR and exchanging our knowledge with 1800 organizations includes of best businesses and development sector in India under one roof is one of the great experience” states Vivek Pawar. Vivek engaged a session -“Incubating and Scaling up ventures for impacts: Engaging business for funding and beyond” at the India CSR Summit 2018 in New Delhi. The session also had the prominent speakers like Aparna Sanjay, Head Social Ventures Incubation Program, IIM Bangalore NSRCEL; Manisha Singh, Head-Impact Funding, CSR, Mphasis; Rachana Iyer, Lead-CSR, Capital First Ltd; Ravi Dhanuka, Co-founder and Director, i-Saksham. 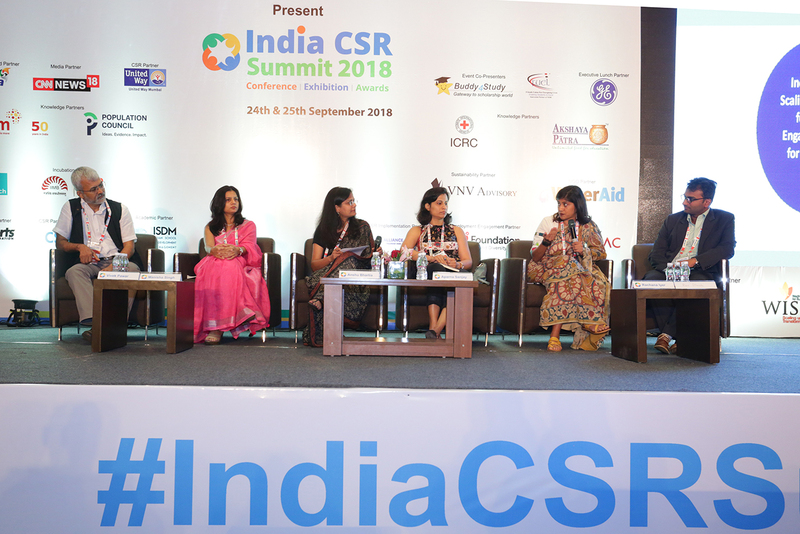 Deshpande Foundation‘s CEO Vivek Pawar is seen during a session -“Incubating and Scaling up ventures for impacts: Engaging business for funding and beyond” with other speakers at the India CSR Summit – 2018. Vivek started the session by identifying that every entrepreneur has two major problems- one is of funding and two is market access. The biggest challenge for incubators is identifying the right entrepreneur with the correct mindset and nurturing that mindset in a right way. More than the idea of an entrepreneurship making a difference, it is the problem that the entrepreneur is passionate about. To figuring out whether that problem is critical for the customer to be solved and will it be able to generate revenue in a sustainable way to become an enterprise is the challenge. Another aspect is to identify the entrepreneur who is between confirming and confronting entrepreneur as they can be enabled to be mentored. One more essential aspect is to eliminate exclusively trade focused entrepreneurs and choose the ones who take a middle way by focusing on both technology and marketing approach for their entrepreneurship idea. Another issue pertaining to incubators-incubatees is to understand the mindset of the investors and make them look towards the problems of India. For India, especially in tier-II cities, resilience is longer, market obstacles are more and even customers take little time to warm up towards the new start-ups and entrepreneurs. So, Vivek suggests that entrepreneurs should be supported and nurtured for a longer duration and accordingly CSR funds should be invested. Overall the session was emphasized on ‘India’s gradual rise as a Social Start-up’ nation and an enabling ecosystem for the new social ventures. The factors leading to business and investors to engage in incubating impact ventures and how these impact ventures work on solving developmental problems had been delved upon. The role played by businesses in creating, supporting and scaling up social ventures through incubators, especially under India’s mandatory CSR provisions was looked at.